Day 2 of the Canadian Association for Food Studies conference began with, quite appropriately, field trips for willing participants. 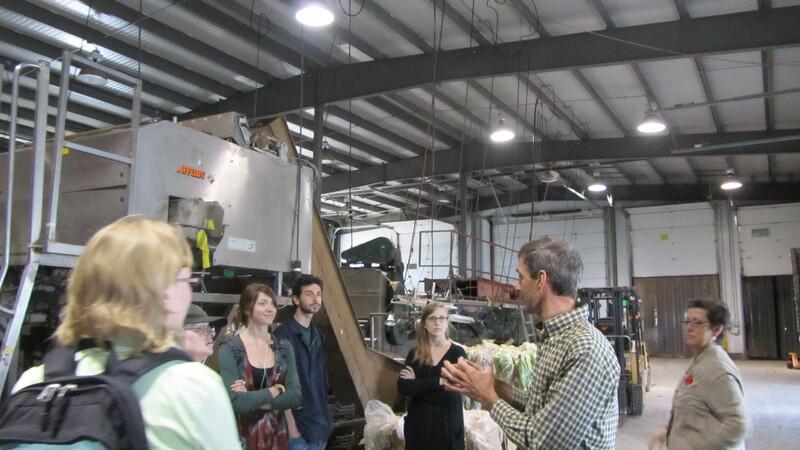 One third of the group embarked on a tour to Barrie’s Asparagus Farm, a growing and processing operation run by fourth-generation farmer, Tim Barrie, who also mills and dehydrates his asparagus into flour for items like asparagus chips, soups, and pasta. Another third found their way over to the Urban Homestead at Little City Farm, a 1/3-acre property attempting to run itself self-sufficiently and sustainably, with innovations such as greywater recycling, permaculture, organic gardens, herbal healing, strawbale housing, a hand-built wood-fired oven, and a passive solar greenhouse. 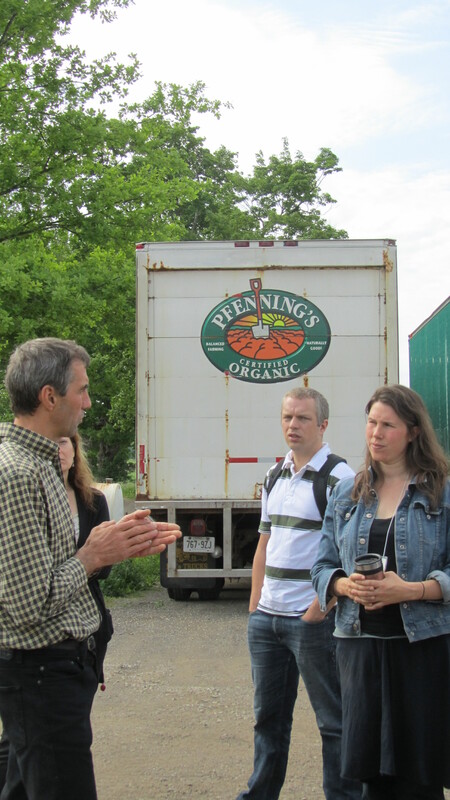 The third and final tour went to Pfenning’s Organic, an organic farm and processing/distribution operation that is playing in important function in the rebuilding of the middle of the Ontario food system, at a mid-scale size. 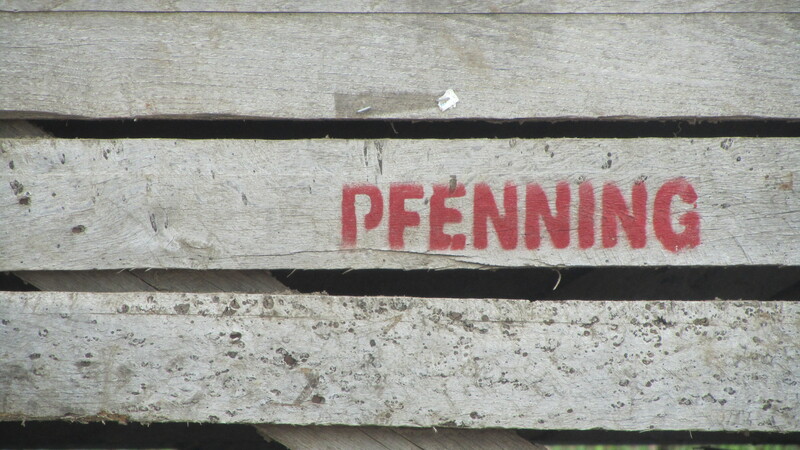 The Pfenning’s operation employs about 100 people, includes a processing/packing facility and a farm shop selling their own as well as other farms’ products. As this was the tour in which I participated, I invite you to join the visit, through the eyes of my camera lens. This is the back of one of the six trucks used to transport Pfenning’s produce to 200 stores each week. They are certified organic, but understand this as a very holistic method of care for their plants, explaining that weeds are a symptom of a mineral imbalance, and an opportunity for you to learn how to improve the soil structure. 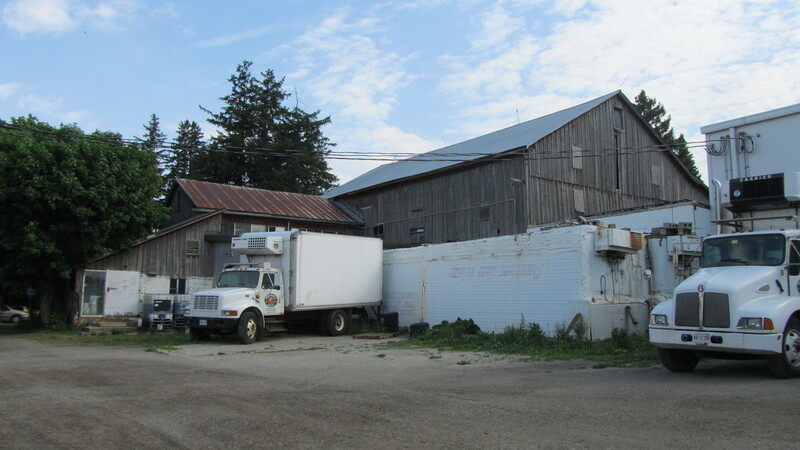 The backside of the farm store and processing facility, which is able to handle the great volume of produce coming through due to careful staging of the crops’ planting and harvesting. The trucks are well-used in that they combine orders for long trips into the city for greater efficiency. Wolfgang Pfenning explains the operations to Carolyn Young (Sustain Ontario) and Stefan Epp-Koop (Food Matters Manitoba). 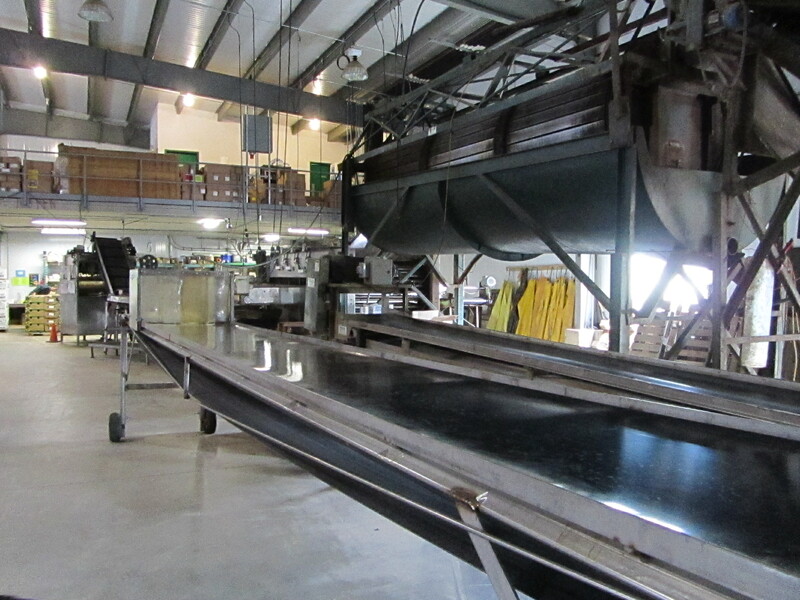 Pfenning’s cultivates 600 acres (400 acres of that in vegetables), and has been operating for 31 years. In the past, they had done sales at Loblaws, but no longer have any ambition to work with big retailers’ giant warehouses and the bullying relationships that come with big business. 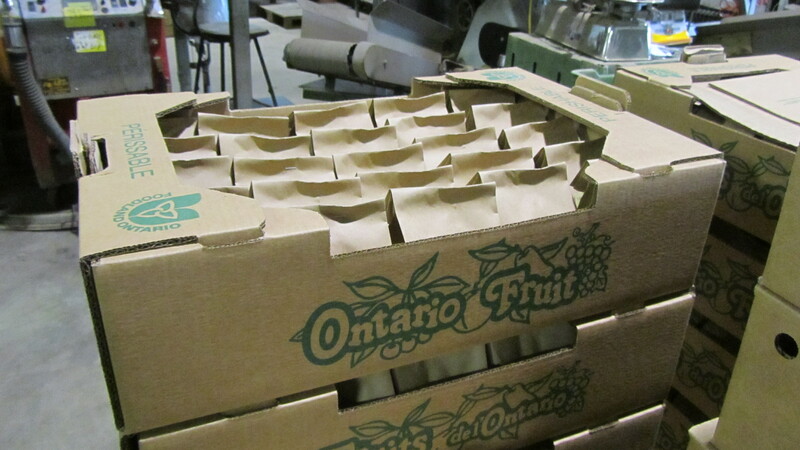 Instead, they largely service food box companies in Toronto such as Mama Earth Organics and Front Door Organics. Diligent note-takers linger on Wolfgang’s eloquent pronouncements. “Don’t get into organic farming to try to get rich faster than your neighbour,” he chuckled, when asked about the viability of organic farming. 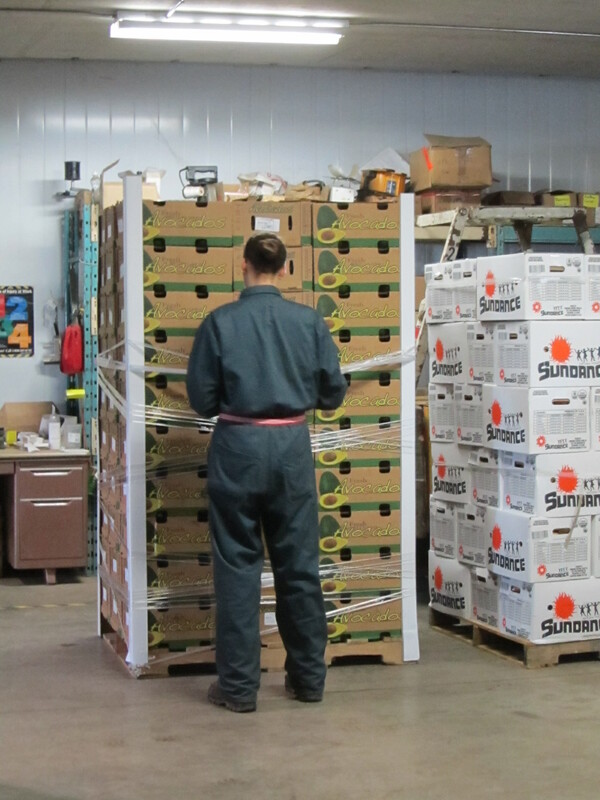 “Be on time, pay your bills, be reliable – that’s all it takes,” he said, referring to his preference to stay out of big business and contractual agreements, referencing the strong relationships between his and 40 other farms in Ontario and Manitoba. 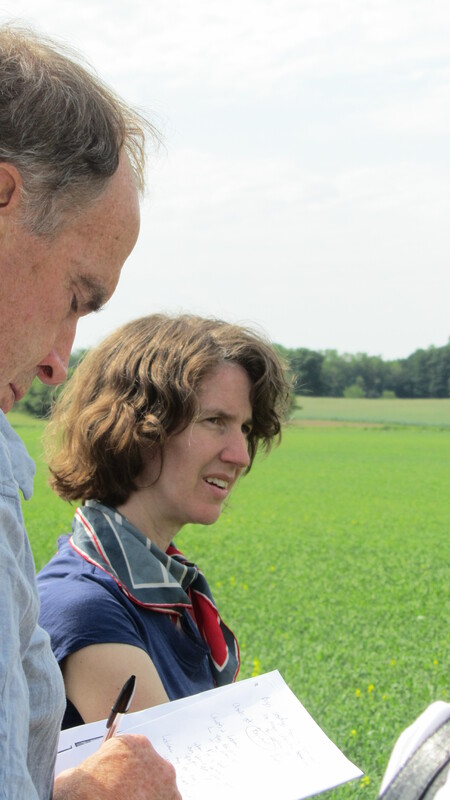 For a group of food scholars, there was much to learn, and as we stood in a pea field listening to how decomposing pea mass can cause protein spikes (like sugar spikes) that encourage flea beetles, which can devour an incoming crop planted too soon. Steffanie Scott, the new President of the Canadian Association for Food Studies, contemplates the field. Wolfgang gave a little lecture on the outrageous walmartization of the organic ‘industry,’ including restaurants and stores who increase prices exponentially for organic foods, when the processing and labour costs remain fixed even though the raw materials increase in price. He suggested, for example, that if you pay 10 cents more for your grain, your loaf of bread should only cost 10 cents more. This lovely conveyor belt was constructed by our tour host, Wolfgang Pfenning himself, in his shop out back. Coincidentally, he hand-built the living quarters of the migrant Jamaican farmers that live on the property. 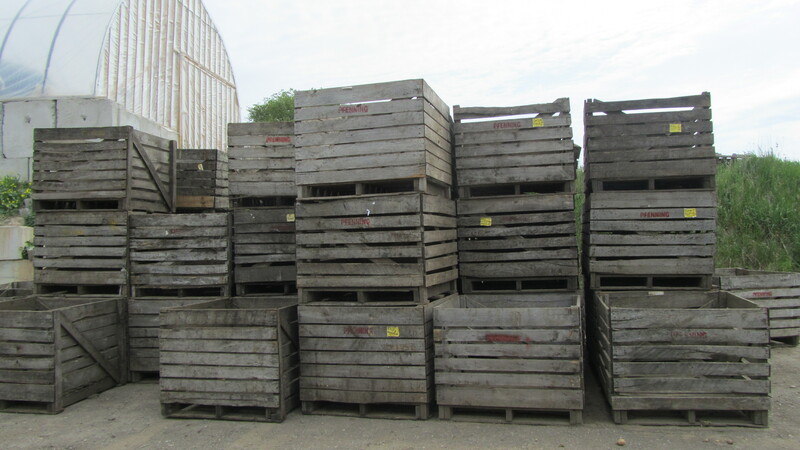 Inside the cold storage facility, a pallet of organic avocados comes in. 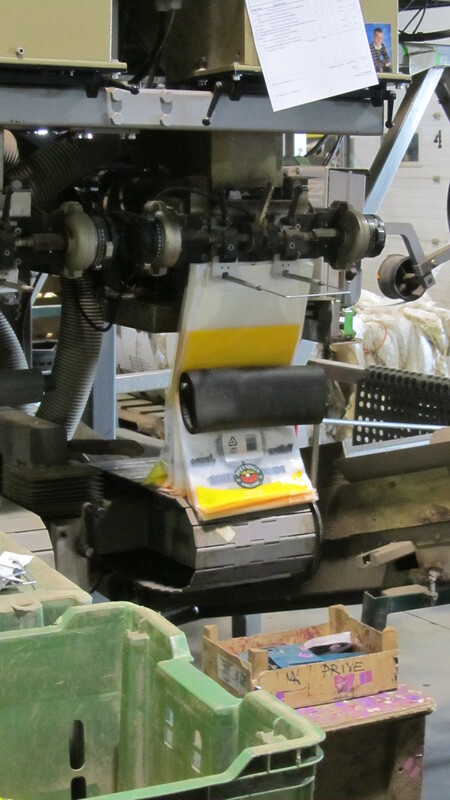 This sizer and washer from Germany calculates and releases a finished weight of produce into a Pfenning’s bag every two seconds. Wolfgang explains the carrot (signature crop) conveyor belt, and the relationship established with a small-ish Californian farm twelve years ago, that agreed to grow to Canadian Organic standards (eschewing sodium nitrate fertilizer commonly used on US organic farms, but banned in Canada). This relationship helped to garner a year-round supply of carrots, and if you eat organic Pfennings’ carrots from March-August, the chances are high that they are from California. But as one scholar said, if you know the name of your farmer, it’s local. What do you think? 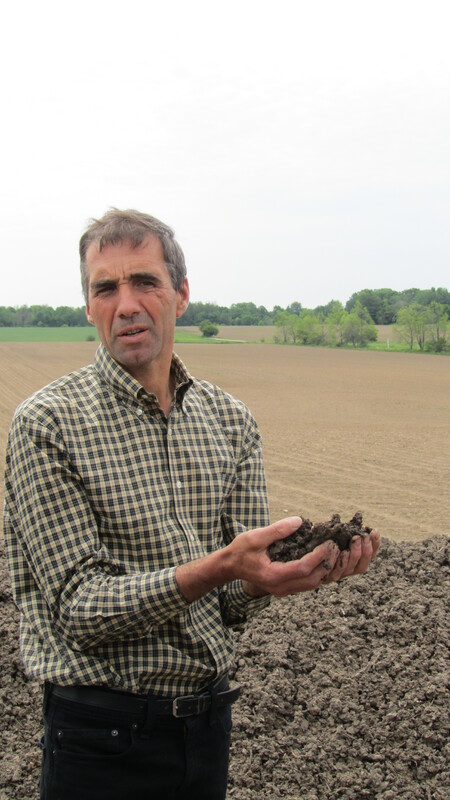 Wolfgang shows us all the rich compost from 3 large piles he overwinters on the property. 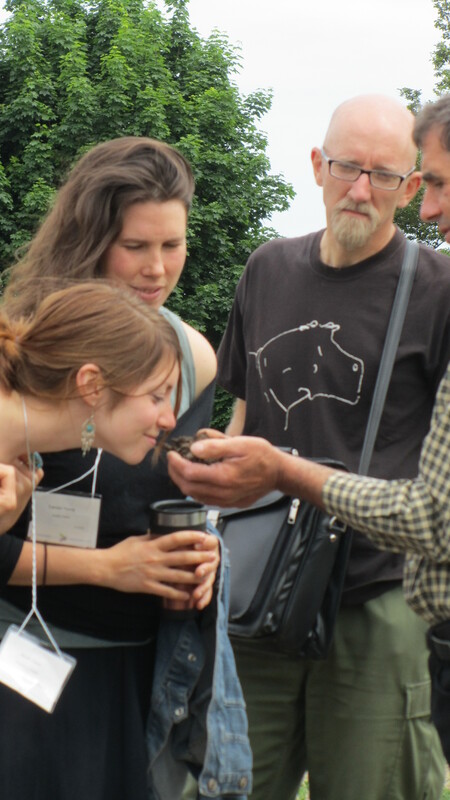 Sarah Corey (U of T), Carolyn Young (Sustain Ontario), and Phil Mount (UGuelph) get their noses into the compost – an odourless mixture of vegetable peelings, gratings, leaf cuttings, as well as horse and rabbit manure. 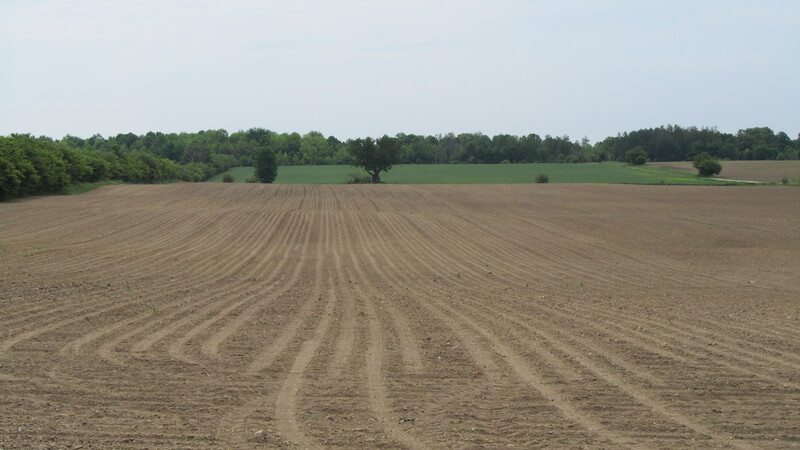 The newly planted fields await a good spring soaking. And the newly informed conference participants head back to Wilfrid Laurier University for a full day of conferencing. – how to create spaces for alternatives within a capitalist society? The afternoon paper sessions included (for me) a great panel on Local Food, and a pecha kucha session, presentations of 20 slides at 20 seconds each, for a total of 6 minutes and 40 seconds. The brevity forces presenters to keep strictly to time and on point, and without questions in between, it allows the audience to weave together a series of perhaps seemingly disconnected subjects into a greater whole, and come back for discussion at the end. Topics included the quieted voice of hunters in academic food literature and alternatives discussions, food performativity and the role of language, supply management, and the cost of local food. It was a fantastic way to take in a snapshot of many different topics and ideas, though received some thoughtful criticism at the end about being involved in a movement where intention is being recreated and replaced into the conversation (think slow food, deep relationships, community building), and the frenzy of the presentation style might have been counter-productive to this way of doing and being. Another ‘conundrum’ for the list! The day ended with a panel on interdisciplinarity within Food Studies, involving two natural scientists, a social scientist, and Paul Finkelstein, the food educator who runs incredible food literacy programs with students in Stratford, and a cafe called The Screaming Avocado. Day 3 of the conference was the perfect conclusion to a great weekend, and included the most relevant sessions to my work and personal research. I attended “Provincial Perspectives on Food Movement Networks: A Roundtable Discussion” and “International Perspectives” which touched upon immigrant health (better than host country health in Canada’s case, but only for the first five years after an immigrant’s arrival) and a fantastic presentation on Bt Cotton and Brinjal (eggplant) in India, the latter sparking a citizen movement that sprung up just after I left my work and research on the sub-continent. The afternoon included the Canadian Association for Food Studies’ AGM, where a new artwork and websites were revealed, the new slate of executives voted in, financials passed, and news about next year’s conference in Victoria was shared. A fascinating lecture from Terry Marsden probed “Solving the Problems of Food Security and Sustainability: The Emerging Place-Making Agenda,” before the assembly headed toward a closing banquet. Jennifer Clapp, who won the Award for Excellence in Food Studies Research, made a striking remark about the global economy which has caused a destructive world food system, and a global food system which is destroying the environment, but somehow, even with this striking realism, we all tucked into our local, seasonal, vegetarian suppers with enthusiasm and I dare even say, optimism. How could you not leave a weekend of food studies conversation a little fuller than when you came? 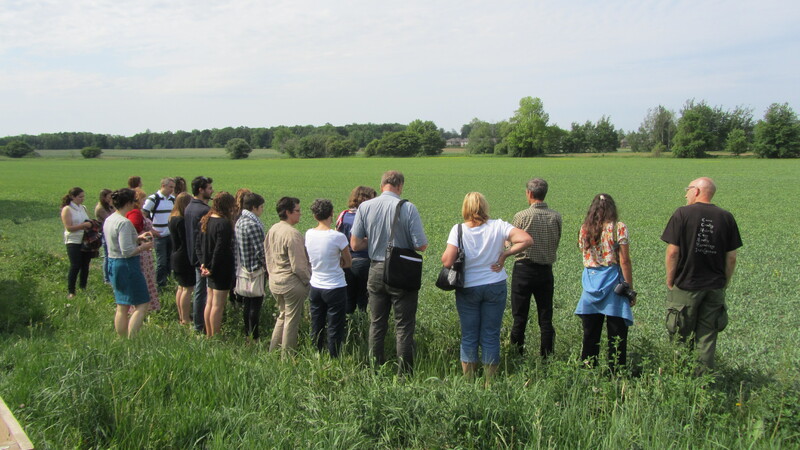 This entry was posted in Blog, Ecological Peace and tagged Canadian Association for Food Studies, distribution, farming, field trip, organic, Pfenning's, processing, rebuilding the middle, Southwestern Ontario by hannahrenglich. Bookmark the permalink.